The cartographic Renaissance of the 16th century in Europe was based on a rapid increase in geographical knowledge sourced from exploration and discovery. Giovanni Francesco Camocio (1501-1575) was an Italian cartographer and publisher active in Venice between 1558 and 1575. 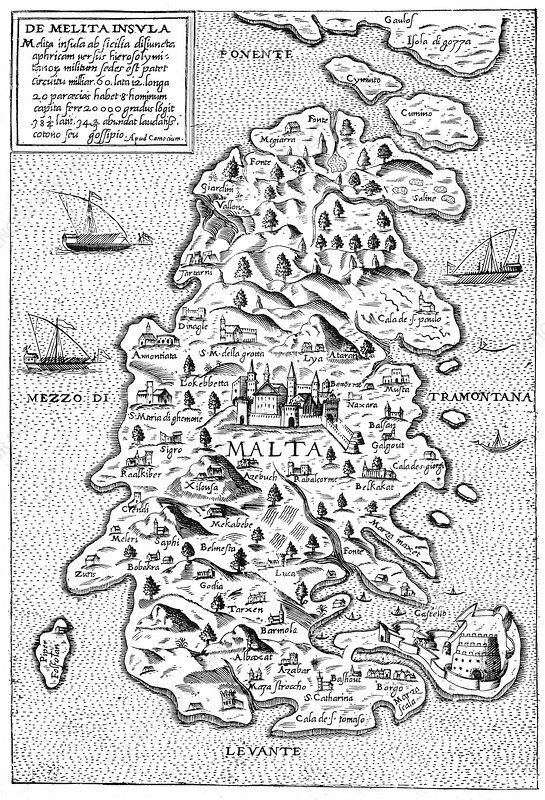 In 1530, Charles V, Holy Roman Emperor, gave the islands to the Knights Hospitaller under the leadership of Frenchman Philippe Villiers de L'Isle-Adam, Grand Master of the Order, in perpetual lease for which they had to pay an annual tribute of one single Maltese Falcon. These knights, a military religious order now known as the Knights of Malta, had been driven out of Rhodes by the Ottoman Empire in 1522. The Knights' presence on the island saw the completion of many architectural and cultural projects.